In February the Government announced new rules on public procurement without any parliamentary or public scrutiny. These rules appeared to restrict public bodies like local councils and universities from refusing to award contracts to certain companies based on ethical grounds and making their own choices to promote ethical trading and investment. A few months ago I held a Westminster Hall debate in Parliament to press the Government on these changes. This was the first opportunity the House of Commons had to actually debate the Government’s plans. Indeed, they had not even announced them in this country at all. Instead, they held a joint press conference in Jerusalem to do so with the Prime Minister of Israel. During the debate, which you can read about or watch here, I asked the Minister six questions to clarify what the new rules in the Public Procurement Notice would mean for public bodies and the UK’s foreign policy towards Israel and Palestine. After the debate I wrote to Matthew Hancock, the Government Minister who made the changes, to write back to me addressing each point. 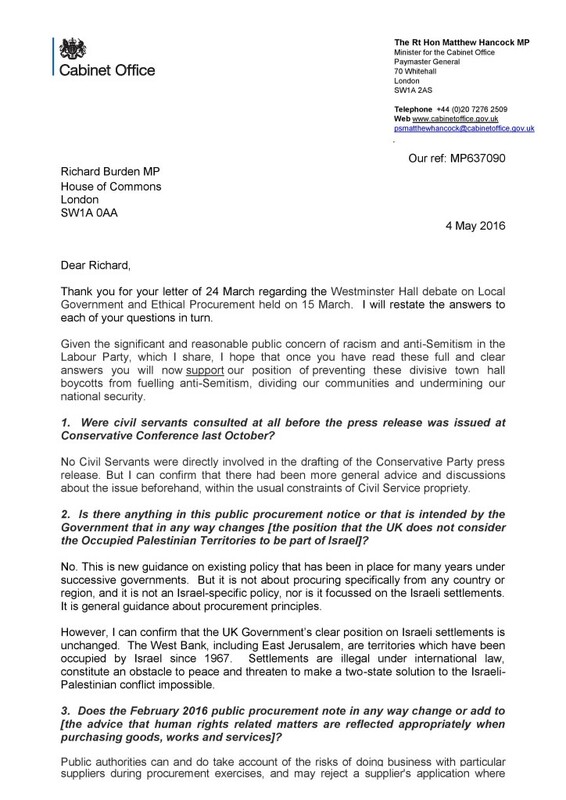 There is nothing in the Public Procurement Notice or that is intended by the Government, which changes the UK’s long-standing position that the Occupied Palestinian Territories are not part of Israel and that settlements in the Occupied Territories are illegal, an obstacle to peace and threaten the two state solution. That, provided it is done on a case by case basis , the Procurement Note does not limit or otherwise alter public authorities from excluding suppliers that are corrupt, guilty of misconduct or found to be aiding and abetting breaches of international laws such as the 4th Geneva Convention. That policy and guidance in local government pension fund investments are the responsibility of DCLG rather than the Cabinet Office. The Minister says, however, that the proposed changes increase rather than decrease the potential for local discretion in decision making. I will follow up these matters with relevant DCLG Ministers. You will also see from Mr Hancock’s letter that he preambles his answers with highly partisan attacks that echo the kind of tone he adopted in a Conservative Party press release that kicked off this whole affair back in October. This, however, appears to bear little relationship to either the six questions I asked him or the substance of the explanations he has finally given in his letter. I have therefore written back to Mr Hancock expressing disappointment at the inflammatory tone he continues to adopt. 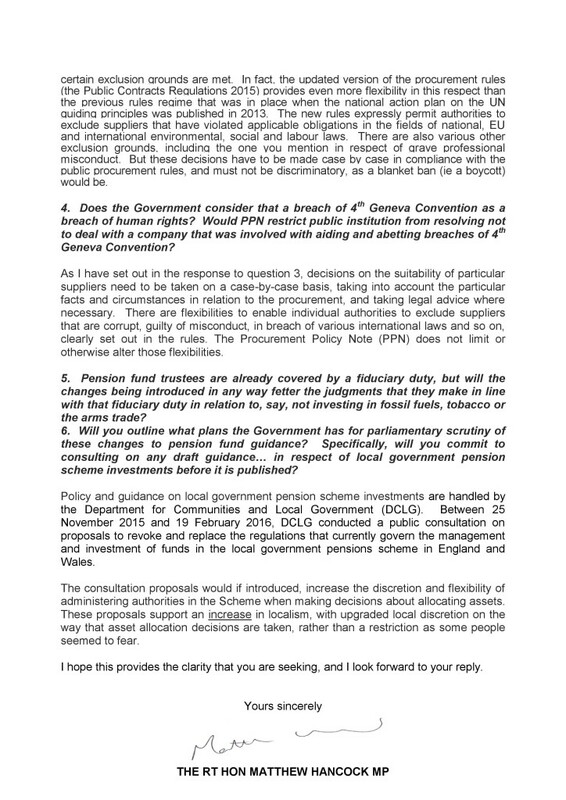 As the substance of the letter still contains important information clarifying that public bodies can continue to take ethical procurement decisions on a case by case basis, irrespective of ministerial hype, I am publishing it in full.